PSCWB Sub Inspector Recruitment 2018: The Public Service Commission West Bengal has published a Vacancy notification for Sub Inspector Post on 17th August 2018. The PSCWB Department wants to recruit 957 well skilled and intelligent candidates through PSCWB Sub Inspector Recruitment 2018. It is a golden opportunity for those candidates who want to get PSC Jobs Recruitment. The Candidate can apply for the PSCWB Recruitment Application Form through the official website. The Last date of applying for an application form is 18th September 2018. 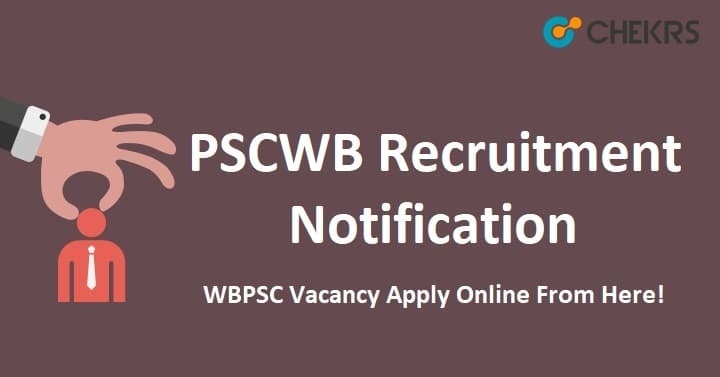 In this article have an information about PSCWB SI Vacancy Notification such as Name of Post, Number of Vacancies, Important date of Application, a way of applying for an Application Form, Official website Link. Remarks: The PSC West Bengal has released a PSCWB Sub Inspector Recruitment 2018. The Candidate can collect more information, they can visit our website that is www.jobs.chekrs.com. Our website is providing latest recruitment notification and news. If you have any query about PSC West Bengal Jobs that you can write comments on commenting box and take a review or feedback.